Development in southern Sandoval County, where arroyos are the primary conduit for passage of overland runoff and watershed-derived sediment, poses complex problems for planning and regulatory agencies and developers. Due to the dynamic nature of arroyos, it is imperative that appropriate steps be taken to protect adjacent structures and facilities from damage due to flooding and erosion. Lining of the arroyos with nonerosive or erosion-resistant material is a common protection method; however, the cost associated with this “hard lining,” in terms of construction and maintenance, as well as degradation of the natural environment, may be unacceptable.  The Southern Sandoval County Flood Control Authority (SSCAFCA) desires to maintain arroyos within their area in a condition that is as safe as possible and in a natural or naturalistic condition, protecting the local environment and meeting policy goals of other governmental agencies. By use of setbacks and selective stabilization, natural and naturalistic arroyos and watercourses can provide protection to adjacent property similar to that provided by lined channels. 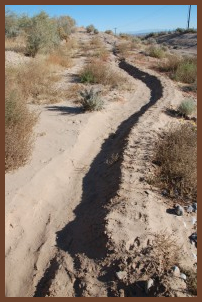 erosion, scour, or lateral migration of a natural (unlined) arroyo by storms up to and including the 100-year storm. Click on LEE Brochure for more information on LEE Lines. This Design Guide describes basic concepts related to the physical processes that control arroyo behavior, provides engineering tools that can be used to quantitatively analyze specific processes, and provides guidance on combining these tools to predict short- and long-term arroyo behavior. Erosion from wind and rain can cause damage to your property. It also creates sediment that is discharged into our drainage systems and waterways. 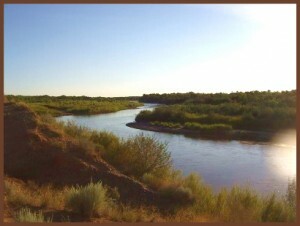 Storm runoff carries sediment and pollutants to the Rio Grande, and causes local governments to spend money to clean streets and repair bridges. 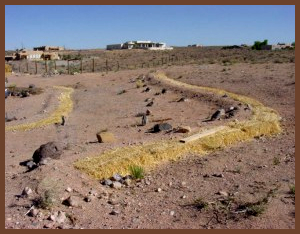 At SSCAFCA, we encourage all property owners to implement erosion-control measures. When you incorporate these measures, you can minimize or eliminate the damage caused to your property by erosion. 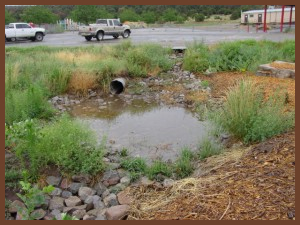 By keeping rainfall on your property, you can prevent it from causing erosion to your soil or neighboring properties, as well as prevent sediment and pollutants from reaching the Rio Grande River. When properly controlled and utilized, rainfall can be used to irrigate landscaping, instead of using our aquifer’s supply of water. Every gallon harvested for landscape use is a gallon saved from the aquifer. Contours are imaginary lines that follow equal elevation points on your landscape. By creating a ditch or swale along the contour, water will spread laterally in the ditch and soak into the soil, instead of flowing downhill and eroding the slope. Swales are the depression or ditch you can dig to move rainfall to a desired location. Because water collects here, swales are a great place to plant trees, shrubs or nonxeric plants. Boomerangs are small half-circle mounds of dirt on the downhill side of shrubs or trees. These allow water to be trapped where the plant can use it, instead of running downhill and gathering speed as it travels. Surge basinscollect large amounts of water, such as rainfall from downspouts and the run-off from hard-scapes such as paved driveways or patios. Because surge basins are designed for high-capacity surges, they need to slow the water’s speed. For best results, locate the surge basin away from your home’s foundation. 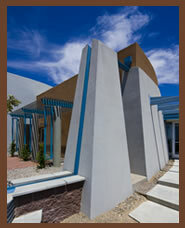 Line it with a geosynthetic fabric and secure it on the ground with landscape staples. This fabric will keep the water from undercutting the soil beneath decorative rock or another suitable material. Using rocks also slows the speed of the water. In areas of slow moving water, the fabric can be omitted and an organic mulch used instead. Mulch can also be an effective erosion control material. Fibrous, woody mulches work best in our area’s heavy but infrequent downpours. 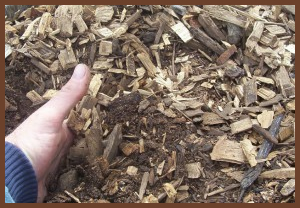 Lighter weight mulches such as crushed nut shells or ﬁ nely shredded bark or leaves often wash away. Mulches not only absorb water, but act as tiny dams to slow the speed of water. By keeping water in the soil, native plants can be established and their root systems will also stabilize the ground. Sponges are buried organic materials that will absorb water and retain it where it can beneﬁ t plants. Following your contours, dig a trench that is 8 to 12 inches deep and 4 to 6 inches wide. Fill that trench with a ﬂ ake from a straw bale, filling back in with the original soil. Sponges made from straw, compost, even newspaper or old telephone books will absorb many gallons of water, controlling runoff and providing an ideal planting environment for many years. Steeper slopes can be lined with entire bales, staked into place. Overflows are channels that would allow rising water in the surge basin to have an appropriate, controlled exit. Overﬂows should be placed to deliberately take this water to a place you want it in your landscaping, and should be lined with fabric and rock.